The NHL Draft Lottery took place in Toronto, Canada on April 9th with the New Jersey Devils winning the big prize of the first overall pick this June. It’s the second time the club has won the lottery in the past three years as lady luck was also on their side in 2017 when they selected Nico Hischier. The native of Switzerland scored 17 goals and 30 assists this year in 69 games after notching 20 goals and 32 assists in 82 contests as a rookie. The New York Rangers will draft second and the Chicago Blackhawks will pick third. The lottery was open to the 15 teams that failed to make the playoffs this season or teams that had acquired first-round draft choices from those clubs via trades. 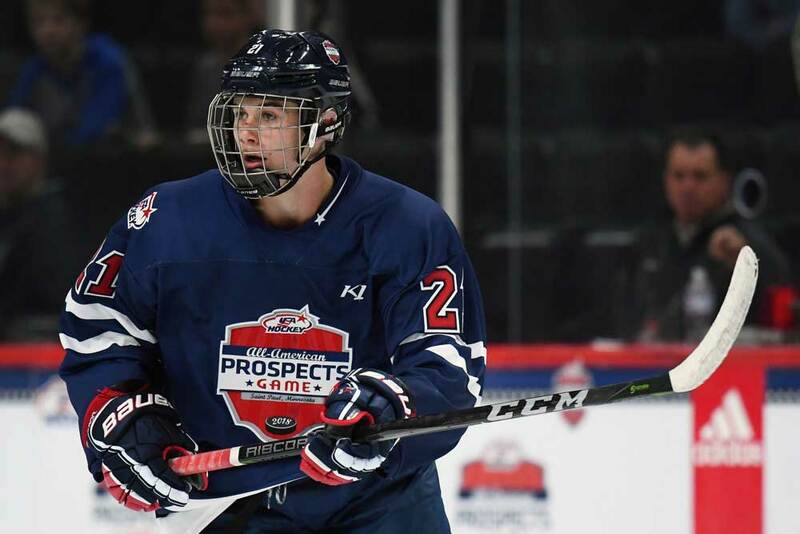 The event was broadcast nationally on television in North America with a representative of each of the 15 teams on hand as well as top prospect Jack Hughes of the USA. The Colorado Avalanche had the best odds of winning since they owned the Ottawa Senators’ first round pick which was acquired in November, 2017 when Ottawa traded for high-scoring forward Matt Duchene. The Senators decided to include their 2019 first-round pick in that swap instead of their 2018 pick. Ottawa then drafted fourth overall last year and selected forward Brady Tkachuk. This meant the Avalanche were guaranteed a top-four pick in this year’s draft. The odds of winning the lottery were the highest for the team with the worst regular-season record and they decreased the higher up the standings (more points) the teams finished. Colorado had the greatest odds of hitting the jackpot since the Senators finished dead last in the 31-team league. Each club’s odds of winning the lottery in percentages were as follows: 1)-Colorado Avalanche 18.5, (2)-Los Angeles Kings 13.5, (3)-New Jersey Devils 11.5, (4)-Detroit Red Wings 9.5, (5)-Buffalo Sabres 8.5, (6)-New York Rangers 7.5, (7)-Edmonton Oilers 6.5, (8)-Anaheim Ducks 6.0, (9)-Vancouver Canucks 5.0, (10)-Philadelphia Flyers 3.5, (11)-Minnesota Wild, (12)-Chicago Blackhawks 2.5, (13)-Florida Panthers 2.0, (14)-Arizona Coyotes 1.5 and (15)-Montreal Canadiens at 1.0. The teams that didn’t luck out in the lottery will draft fourth to 15th in comparison to the points they earned during the season from lowest to highest. This means Colorado will draft fourth followed by 5-Los Angeles, 6-Detroit, 7-Buffalo, 8-Edmonton, 9-Anaheim, 10-Vancouver, 11-Philadelphia, 12-Minnesota, 13-Florida, 14-Arizona and 15-Montreal. But even though Colorado ended up with the fourth pick it was a huge disappointment for the club as they slid down the pecking order as far as possible. In fact, just four of the past 11 draft lotteries have been won by the team with the best odds. The Devils were obviously the big winners as were the Rangers and Blackhawks. New Jersey entered the lottery with the third-best odds while the Rangers had the sixth-best chance and the Blackhawks had the 12th-best shot. New Jersey moved up two spots while the Rangers climbed four and Chicago jumped nine. This will be the first time the Rangers have a top-three draft pick in the franchise’s history. Joining Colorado on the losing side were Los Angeles as they slipped from second to fifth, Detroit dropped from fourth to sixth, Buffalo fell from fifth to seventh., Edmonton went from seventh to eighth, Anaheim from eighth to ninth, Vancouver from ninth to 10th and Philadelphia from 10th to 11th. New Jersey will exercise their right to take the first overall pick when the NHL Draft take places June 21/22 in Vancouver. The general consensus is that American center Jack Hughes of Orlando, Florida will be taken first. The 17-year-old captained the American National Development Team this season. Hughes notched 48 points in 24 games on 12 goals and 36 assists. He also played 48 games with his country’s Under-18 squad where he was the captain and racked up 23 goals and 63 helpers for 86 points. Hughes is currently ranked the number one skater in North America by the NHL Central Scouting Bureau. His closest rival is winger Kappo Kakko who is ranked as the top European skater. Like many of today’s NHL stars, Hughes is on the smaller side as he stands just 5-feet-10-inches tall and weighs about 170 lbs. He’s an excellent skater who’s in constant motion with good speed, fine stickhandling skills and a knack for creating offensive chances for himself and his teammates. As is the norm with smaller players, there are knocks about his size and it’s possible Hughes could be converted to a winger sometime down the road. But at the age of 17 his body will continue to mature and grow as he gets bigger and stronger. Some hockey experts believe the left-handed shooting Hughes could be the best American-born prospect ever due to the way he’s dominated in every league he’s played. That means he’s in some pretty good company such as Mike Modano, Auston Matthews, Patrick Kane and Jack Eichel. Other players who are considered to be top prospects include: forwards Vasily Podkolzin, Dylan Cozens, Alex Turcotte, Trevor Zegras, Kirby Dach, Matthew Boldy, Peyton Krebs and defenseman Bowen Byram. NHL scouts will get one more chance to fine tune their draft lists during the IIHF World Under-18 Championships which faces off in Sweden on April 18th. However, it’s probably safe to say Hughes will go first with Kakko and Podkolzin rounding out the top three in either order. The Devils have some good young talent to work with in the likes of Hischier and 2017/18 Hart Trophy winner Taylor Hall. They also have Kyle Palmieri, Travis Zajac, Jesper Bratt and Will Butcher in the lineup as well as a good goaltending prospect in Mackenzie Blackwood. New Jersey finished in eighth and last place in the Metropolitan Division this year and second-last in the Eastern Conference with a record of 31-41-10 for 72 points, missing the playoffs by 26 points. They need all the help they can get and if they take Hughes in the June draft as expected the team should challenge for the postseason as early as next year.